The Bunker Renovation Project Has Been Completed! Subscribe to our e-Club for golf course specials. 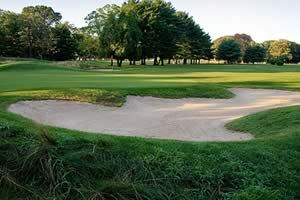 Longshore Golf Course is the premier municipal golf course in Fairfield County. Orignally built in the mid 1920's by Orin E. Smith and renovated by architect John Harvey, Longshore is ideally located just 50 miles from Grand Central Station. The former onion farm has been transformed to what many golfers have called "the most sporting 18 holes ever built." From its tree-lined Augusta style entrance, well -bunkered greens to its Long Island views, you will thoroughly enjoy this 5,800 yard course. In 2008, Golf Digest magazine voted Longshore one of the best places to play golf. It has been said that it's the course which brings you to Westport, but it's the town that keeps you here. Come enjoy the family atmosphere of this beautiful golf course and relax in the award-winning Inn at Longshore. We also offer Golf Instruction and host many golf events. Green and tee aeration will take place between Monday, April 15th and Friday, April 19th. Tentative schedule is for green aeration to be done Monday thru Wednesday and tee aeration to be done Thurday and Friday.